This study was a comparative investigation of the clinical effectiveness of intramuscular (IM) olanzapine, and IM haloperidol in acute agitated patients with schizophrenia. The subjects were 58 schizophrenic patients with psychomotor agitation (moderate and severe) in the emergency ward of a psychiatric hospital. Their clinical symptoms were assessed using Positive and Negative Syndrome Scale Excited Component (PANSS-EC), and anti-agitation treatments with antipsychotics were evaluate at the beginning of treatment, and at 30, 60, 90 and 120 minutes. This was done using the Positive and Negative Syndrome Scale Excited Component (PANSS-EC). The mean of clinical symptoms from baseline on the PANSS-EC, were different in the groups IM olanzapine 10mg and IM haloperidol (5mg and 10 mg). Statistically significant differences of PANSS-EC scores were found for moderate and severe psychomotor agitation, when comparing times of study for each treatment group. The results of this study suggest the possibility that the anti-agitation effects of IM haloperidol (10 mg) are more rapid than those of IM haloperidol 5mg and IM olanzapine 10 mg. No extrapyramidal symptoms (EPS) were observed. Psychomotor agitation is a clinical syndrome typified by its acute manifestation and fluctuating course. It characterizes itself by mental, emotional and cognitive excitement, inadequate and purposeless increase of motor and verbal activity, which gravely alters the behaviour of the subject [1-3]. The incidence of psychomotor agitation occurs in 10% of patients who resort to an emergency health service [1-6]. In line with the primary underlying psychiatric cause for psychomotor agitation, it has been established that psychotic disorders such as schizophrenia and bipolar disorder are the most common causes of psychomotor agitation. In a study, it was estimated that amongst 3.4 million consultations given in psychiatric emergency services in the United States, 21% of individuals suffering from psychomotor agitation had previously been diagnosed with schizophrenia; 13% had been diagnosed with bipolar disorder; and 5% had been diagnosed with dementia . On the other hand, it is estimated that approximately 20% to 28% of patients diagnosed with schizophrenia suffer from episodes of agitation throughout their lives [1-4]. A general mechanism of agitation has been suggested, the neurotransmitters involved in the internal functioning of the cortical-thalamusstriated- cortical circuit are principally the gamma aminobutyric acid and the glutamate. The two latter usually both reach an inhibition/ excitation balance, while, externally, the circuit receives communication from other brain levels, such as the pars compact of the substantia nigra, the ventral tegmental area, and the median rafe nuclei. The striatum projects neural connection to globus pallidum interno and substantia nigra pars reticulata in two ways 1) Direct: it consists of neurons containing gamma aminobutyric acid and substance P, which are inhibitory, 2) Indirect: start with neurons containing gamma aminobutyric acid and enkephalin, then projecting the external globus pallidum, which sends inhibitory projections to the subthalamic nucleus, and then to the internal globus pallidum and substantia nigra, which are connections to the excitatory pathway glutamate. Dopamine, serotonin and noradrenaline, liberated from the subcortical levels towards the circuit, favour overstimulation of the direct tract of the circuit. The consequence being motor hyperactivity, this explains why antipsychotics were approved for pharmacologic control [3,8]. Clinical guidelines have been published at the international level, containing algorithms to handle patients with schizophrenia and psychomotor agitation. These guides recognize the similar efficacy of haloperidol and olanzapine to control psychomotor agitation symptoms; however, this is not the case for its comparative effectiveness in the clinical environment of an emergency service [1,5,8,9-13]. In general, the clinical guidelines recommend the use of second-generation antipsychotics (such as olanzapine) as the first line of treatment. Nevertheless, amongst the most viable options, the use of traditional antipsychotics, such as haloperidol, is still considered . The main difference between both types of antipsychotics, is the lesser risk of movement-related disorder induced by the antipsychotic (parkisonism, acute dystonia/dyskinesia and akathisia) [11,12]. In Mexico, the anti-agitation effectiveness of antipsychotic use in patients with psychomotor agitation has not been reported. In this study, we will look at the effectiveness of a second-generation antipsychotic, olanzapine, in comparison to an antipsychotic of first generation, haloperidol, to control psychomotor agitation in patients suffering from schizophrenia treated in the emergency services of a psychiatric hospital. The study was an open-label, naturalistic observation of schizophrenia patients who required medication for psychomotor agitation. To fulfill the ethical aspects of research with human beings, the protocol of study (18C 19) was approved by the Research Ethics Committee of the psychiatric hospital where this study was undertaken, on the 4th June 2015. Fifty-eight patients from the emergency ward of the psychiatric hospital of Mexico were enrolled in this study during a six month period, from June to November 2015. All patients had medical record within the hospital, with a previous diagnosis of schizophrenia according to the Diagnostic Criteria on Schizophrenia, taken from the International Classification of Diseases (ICD-10) . Inclusion criteria were as follow: all patients had total scores of 14 or higher on the Positive and Negative Syndrome Scale Excited Component (PANSS-EC) with a score of 4 or higher on at least one item, and the treating psychiatrist concluded that the patient needed to be treated with an IM injection, of olanzapine or of haloperidol, which are the two most utilized and available antipsychotics in hospital emergency services. Patients diagnosed with psychomotor agitation who had not been diagnosed with schizophrenia and who had not completed the applications of measurement tools, were excluded from the study. All patients and relatives involved signed an informed consent document, authorizing their participation in this study. TThe Positive and Negative Syndrome Scale Excited Component (PANSS-EC) was applied at each patient’s admission, in order to measure basal severity of psychomotor agitation. This enabled us to obtain a basal score, to then apply initial doses of intramuscular injection of olanzapine 10mg, haloperidol 5 mg or haloperidol 10 mg, The applications of intramuscular injection were according to the clinical practice guideline for managing agitation in the hospital. During the study, measurements were once again taken after 30, 60, 90 and 120 minutes. Concomitantly, measurements based on the Abnormal Involuntary Movements Scale (AIMS)  were taken to assess the presence of extrapyramidal symptoms; this scale was used because the patients had been previously treated with antipsychotic. Also, a clinical examination was made to explore extrapyramidal symptoms such as akathisia, tremor, dystonia or Parkinsonism. The PANSS-EC [16,17 ] consists of 5 items, which each have an identification code with an ascending number and a letter representing the general component of origin (P= Positive; G= General Psychopatology; and N= Negatives): [17-19] agitation (item P4), hostility (item P7), motor tension (item PG4), lack of cooperation (item G8), deficient control of impulses (item PG14). The items are measured from 1 (not present) to 7 (severe). The total score goes from 5 to 35 points. In line with the score obtained, the severity of agitation was classified: mild agitation from ≥14 to ≤19 points, moderate agitation from ≥20 to ≤29 points, and severe agitation from ≥30 puntos. A clinical improvement of psychomotor agitation was defined as the reduction of ≥7 points or ≥40% in comparison to basal score of measurements at 30, 60 y 90 minutes. A clinical remission of psychomotor agitation was defined as a reduction of ≥7 points or 40% in comparison with basal score of the measurements taken after 120 minutes. The PANSS-EC was used to measure improvement or remission of psychomotor agitation. Direct comparisons of baseline demographics and the changes in each assessment score (basal, 30 minutes, 60 minutes, 90 minutes and 120 minutes) were analyzed using bivariate analysis, undertaking tests such as Chi2 and Kruskall Wallis, with the statistical software SPSS© v.20. The sample included 58 patients diagnosed with schizophrenia who all presented psychomotor agitation as a motive for consultation in the emergency services of a psychiatric hospital. In 95% of the sample, individuals had a diagnosis of paranoid schizophrenia and only 5% had a diagnosis of schizophrenia of a different kind; the evolution time of schizophrenia was 8.3 years (standard deviation 7.8). Regarding the presence of comorbidities, 21% were obese, 9% had hypertension and 3.4% had diabetes mellitus. Concerning use of psychoactive substances, it appeared in 77.6% of the study sample, of which, tobacco consumption represents 72%, alcohol abuse 31%, and use and abuse of cannabis 17.2%. All patients included in this study had discontinued treatment at least two weeks or more. In the study sample 50% (n=29) were female, with an average age of 35 years old (minimum was 18 years old, maximum was 59 years old); and 43% of the sample (n=25) did not have any employment or occupation. No statistically significant correlation was found between sociodemographic characteristics and response to treatment, only in the basal score of the severity of psychomotor agitation (p<0.001) (Table 1). Nevertheless, for the analysis, six patients were excluded, one patient by presenting sedation when applying olanzapine, and five patients because other sedatives drugs were administered before the 30 minutes. In line with the severity of psychomotor agitation, of 43% moderate cases and 57% severe cases, the group of moderate psychomotor agitation have a lower score than the severe psychomotor agitation group (p<0.001). The scores of psychomotor agitation throughout the various stages of study with the different types of treatments are expressed as medians with minimum and maximum values (Table 2). Table 2: Global score of psychomotor agitation between groups of treatment. For the case of moderate agitation, comparing treatment groups (haloperidol 5mg, haloperidol 10mg, and Olanzapine 10mg): a statistically significant difference was found in the basal measurement between these groups. This same situation was observed when comparing effectiveness of the treatments or the degree of response between the study times of each treatment group. In all cases, the differences found are statistically different (Figure 1). *p<0.005 All measurements. **p<0.001 All measurements. 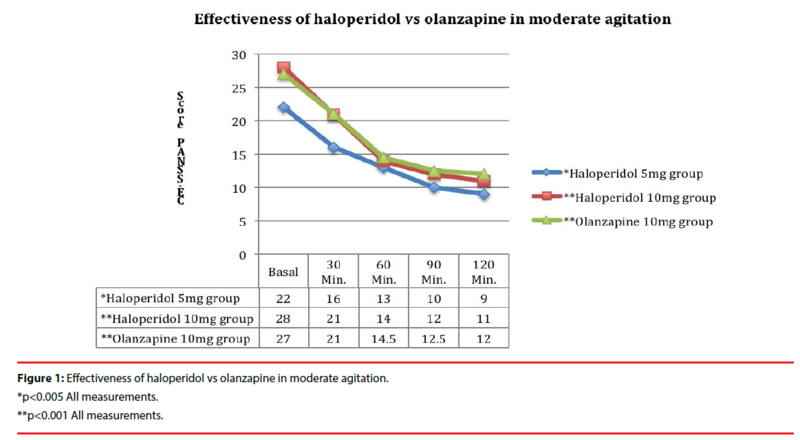 Figure 1: Effectiveness of haloperidol vs olanzapine in moderate agitation. In the case of severe psychomotor agitation, comparing treatment groups (haloperidol 5mg, haloperidol 10mg, and olanzapine 10mg), no statistically significant differences were found in the basal measurement. Comparing effectiveness of the treatments in the various study times in each treatment group, a statistically significant difference was found in between each timegroup in the haloperidol 10 mg group. This situation was distinctively different for patients who received treatment with haloperidol 5 mg and olanzapine 10mg, in which cases only certain study-time groups showed statistically significant differences (Figure 2). *p<0.001 Measurements at 30, 60, 90 and120 min. **p<0.001 Measurements at 90 and 120 min. 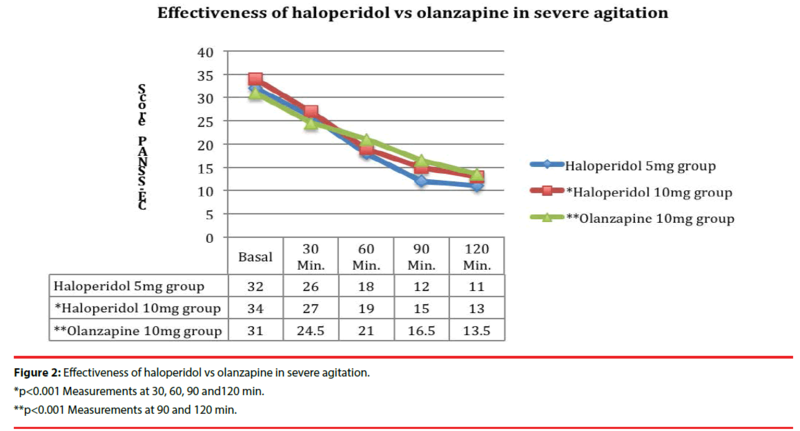 Figure 2: Effectiveness of haloperidol vs olanzapine in severe agitation. In all patients with severe psychomotor agitation, and 46.5% of patients with moderate psychomotor agitation, physical restraint was applied. Psychomotor agitation is a frequent cause of psychiatric emergency. It is a complex syndrome, hard to handle, which imposes one to carry out appropriate and effective therapeutic actions which include pharmacological steps. The findings of the present study enable us to conclude that there were no statistical differences in demographic variables between groups, however, it is important to note that the lesser proportion of males in the haloperidol 10mg group (43.8%) relative to the olanzapine 10 mg group (60%), would tend to bias the haloperidol group against cases of acute dystonia, leading to the appearance of less morbidity with haloperidol than in the sample of this study. To evaluate and compare therapeutic action of indicated medicine, specifically anti-agitation effect of the antipsychotics, we first started with the identification of 2 different frames of psychomotor agitation: moderate and severe. The results obtained enabled us to identify that in all cases, independently of the intensity of psychomotor agitation, we found reductions in the score on the Scale of PANSS-EC throughout the different study-times. This suggests a good therapeutic response when using haloperidol or olanzapine, only as effect anti-agitation. These results are consistent with other studies reported; there is to this day no particular medicine which surpasses another [1,4,6]. In our study, in the cases of moderate psychomotor agitation, either of the previously suggested alternatives is effective. For this reason, the selection of the antipsychotic should be based on the availability of the medicine, its cost, adverse effects, and the experience of the treating doctor, amongst other factors for example if there is any counter-indication for a particular patient to use haloperidol or olanzapine. The two arguments made above seem to be concurring with what has been reported in other naturalistic studies [20-24] in which it has been repeatedly found that, despite the similar effectiveness of overall reduction of the PANSSEC score between haloperidol and olanzapine, patients who have received haloperidol treatment seem to suffer from higher clinical severity on the PANSS-EC scale, in comparison with those who received olanzapine. This study, although the groups might have been too small to reach a significant difference (type II error), has demonstrated that both types of antipsychotics are effective to control psychomotor agitation, not all published studies have found that haloperidol 5mg and olanzapine 10mg are equally effective, one study has suggested superior efficacy after intramuscular olanzapine in comparison with intramuscular haloperidol in agitated elderly patients with schizophrenia , another study reported that olanzapine is more rapidly effective than haloperidol and improves poor impulse control and excitement of patients , therefore, olanzapine has a different pharmacological profile than haloperidol, and when the antipsychotics are chosen it is necessary to consider other clinical variables in patients. Moreover, an absence of extrapyramidal symptoms in this study may reflect the fact that our sample size was too small to produce a significant result . The compared effectiveness of the different available pharmacological options should be further researched, in order to design application standards depending on severeness of the agitation on one hand; but also to evaluate the plausibility of applying clinimetric scales, so that an objective framework of severity of agitation is created to establish norms in the decision-making process when prescribing medication for this condition. Other aspects which remain to be further studied, in agreement with the most recent protocols of management of agitation are: 1) to recognize agitated patients who are in the position to accept psychopharmacos by other routes, and 2) exclusively use the intramuscular route for patients who do not respond to other treatment modalities. Furthermore, it is also important to evaluate the use of physical restriction and its duration in relation to the treatment to which one has resorted. Other aspects to be considered in the comparative assessment of the use of antipsychotic with effect anti-agitation are the advantages and disadvantages in terms of both efficacy and safety, as this later would subsequently lead to better compliance over the time, and therefore, better efficacy overall during the lifespan of the patients with schizophrenia. Garriga M, Pacchiarroti I, Kasper S, et al.Assessment and management of agitation in psychiatry: Expert consensus. World. J. Biol. Psychiatry17(2), 86-128 (2016). Day RK. Psychomotor agitation: poorly defined and badly measured. J. Affect. Disord55(2-3), 89-98 (1999). Sachs GS. A review of agitation in mental illness: burden of illness and underlying pathology. J. Clin. Psychiatry 67 (10), 5-12 (2006). Paccardi B, Mauri M, Cargioli C, et al. Issues in the management of acute agitation: how much current guidelines consider safety? Front. Psychiatry4(26), 1-10 (2013). Schleifer JJ. Management of acute agitation in psychosis: an evidence-based approach in the USA. Adv Psychiatr. Treat 17(2), 91-100 (2011). Zeller SL, Rhoades RW. Systematic Reviews of Assessment Measures and Pharmacologic Treatments for Agitation. Clin. Ther32(3), 403-425 (2010). Marco CA, Vaughan J. Emergency management of agitation in schizophrenia. Am. J. Emerg. Med 23(6), 767-776 (2005). Lindenmayer JP. The pathophysiology of agitation. J. Clin. Psychiatry61(14), 5-10 (2000). Holloman GH, Zeller SL.Overview of project BETA: best practices in evaluation and treatment of agitation. West. J. Emerg. Med13(1), 1-2 (2012). Nordstrom K, Zun LS, Wilson MP, et al.Medical evaluation and triage of the agitated patient: consensus statement of the American association for emergency psychiatry project beta medical evaluation workgroup. West. J. Emerg. Med13(1), 3-10 (2012). Stowell KR, Florence P, Harman HJ, et al.Psychiatric Evaluation of the Agitated Patient: Consensus Statement of the American Association for Emergency Psychiatry Project BETA Psychiatric Evaluation Workgroup. West. J. Emerg. Med13(1), 11-16 (2012). Hankin CS, Bronstone A, Koran LM. Agitation in the Inpatient Psychiatric Setting: A Review of Clinical Presentation, Burden, and Treatment. J. Psychiat. Pract17(3), 170-185 (2011). Wilson MP, Pepper D, Currier GW, et al.The Psychopharmacology of Agitation: Consensus Statement of the American Association for Emergency Psychiatry Project BETA Psychopharmacology Workgroup.West. J. Emerg. Med13(26), 26-34 (2012). World Health Organization. International Classification of Diseases 10th Revision. ICD-10. Geneva, Switzerland; WHO (1990). Rush JA. Handbook of psychiatric measures. American Psychiatric Association: Washington, DC; APA, USA (2000). Lindenmayer JP, Brown E, Baker RW, et al.An excitement subscale of the Positive and Negative Syndrome Scale. Schizophr. Res68(2-3), 331-337 (2004). Montoya A, Valladares A, Lizán L, et al.Validation of the Excited Component of the Positive and Negative Syndrome Scale (PANSS-EC) in a naturalistic sample of 278 patients with acute psychosis and agitation in a psychiatric emergency room. Health. Qual. Life. Outcomes9(18), 2-11 (2011). Kay SR, Fiszbein A, Opler LA. The positive and negative syndrome scale (PANSS) for schizophrenia. Schizophr. Bull13(2), 261-276 (1987). Pascal JC, Madre M, Puigdemont D, et al.A naturalistic study: 100 consecutive episodes of acute agitation in a psychiatric emergency department. Actas. Esp. Psiquiatr34(4), 239-244 (2006). Castle CJ, Udristoiu T, Kim CY, et al.Intramuscular olanzapine versus short-acting typical intramuscular antipsychotics: Comparison of real-life effectiveness in the treatment of agitation. World. J. Biol.Psychiatry 10(1), 43-53 (2009). Escobar R, San L, Pérez V, et al.Resultados de efectividad de olanzapina en pacientes psicóticos agudos con agitación en servicios de urgencias: resultados del estudio NATURA. Actas. Esp. Psiquiatr36(3), 151-157 (2008). Huang CL, Hwang TZ, Chen YH, et al.Intramuscular olanzapine versus intramuscular haloperidol plus lorazepam for the treatment of acute schizophrenia with agitation: An open-label, randomized controlled trial. J. Formosan. Med. Assoc114(5), 438-445 (2015). Breir A, Meehan K, Birkett M, et al.A double-blind, placebo-controlled dose-response comparison of intramuscular olanzapine and haloperidol in the treatment in the acute agitation in Schizophrenia. Arch. Gen. Psychiat59(5), 441-448 (2002). Suzuki H, Gen K, Takahashi Y. A naturalistic comparison of the efficacy and safety of intramuscular olanzapine and intramuscular haloperidol in agitated elderly patients with schizophrenia. Ther.Adv. Psychopharmacol 3(6), 314-321 (2013). Suzuki H, Gen K, Takahashi Y. A naturalistic comparison study of the efficacy and safety of intramuscular olanzapine, intramuscular haloperidol, and intramuscular levomepromazine in acute agitated patients with schizophrenia. Hum. Psychopharmacol. Clin. Exp29(1), 83-88 (2014).